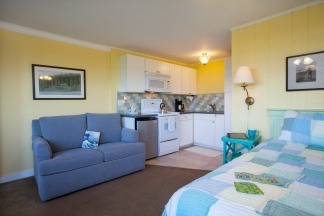 This charming ocean front studio is located on the ground floor of our Sea Sprite at Haystack Rock Hotel. Come watch an amazing Oregon coast sunset while relaxing in bed. 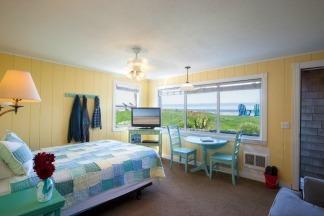 This ocean front room has a southwesterly view from its large picture windows and a full kitchen. This unit also features a private patio where you can sit and enjoy our beautifully landscaped grounds. Perfect for a couple or small family, the Sunset Studio features a queen-size bed and a twin-size sleeper sofa. Sleeps 2 to 3 people. This ocean front studio offers fantastic views of the Pacific Ocean. Our quiet location south of Haystack Rock provides a peaceful retreat for those looking for a place to replenish and renew.